1. Reword of “investment holding company to “company whose principal activity is the holding of investment including properties, shares of other companies or loans”. 2. Amendment to Form GST-03：Item 15 is changed from Total Value of GST Suspended under Item 14 to Total Value of Other Supplies. The amendment in regards to point (1) specify the scope of the investment holding company to clarify that such companies would not be able to treat exempt financial supplies as incidental financial supplies and the respective input tax credit is not claimable. 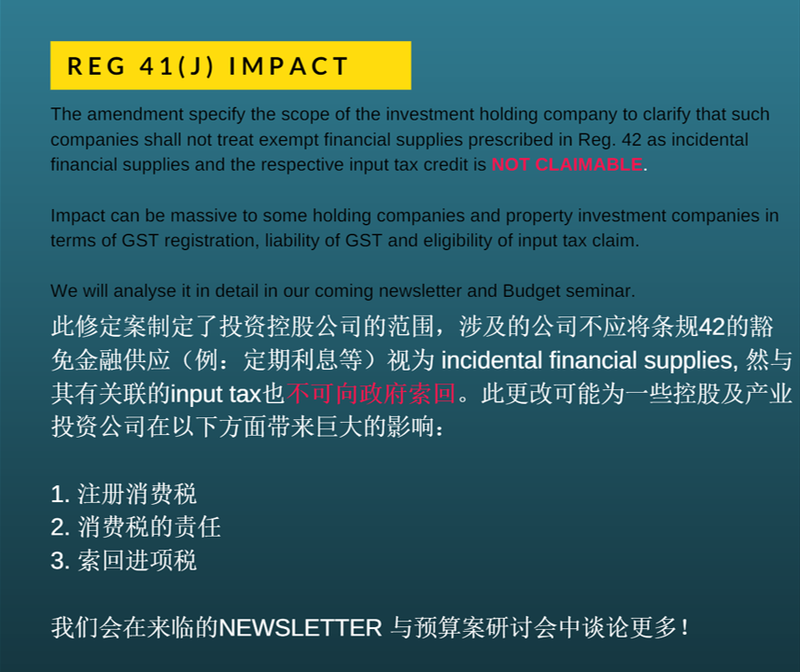 Impact can be massive to some holding companies and property investment companies in terms of GST registration, liability of GST and eligibility of input tax claim. Amendment mentioned in point (2) states that supplies that are not reported in item 5, 10, 11, 12 and 13 would be included in item 15. 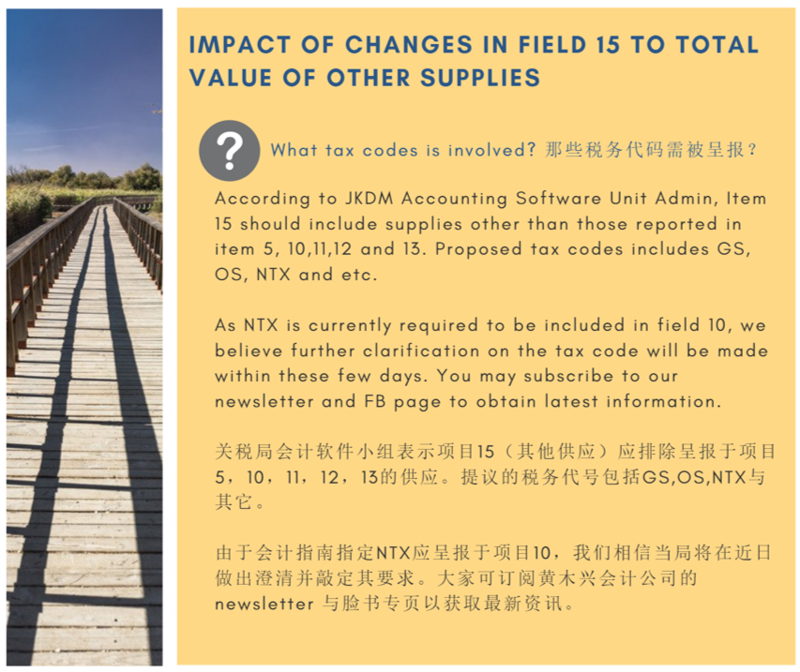 Proposed tax codes includes GS, OS, NTX. 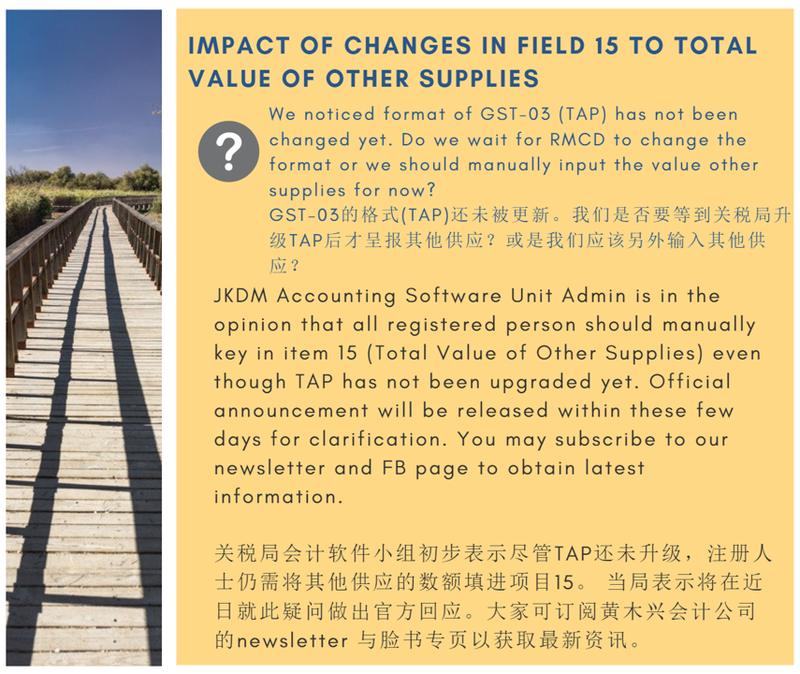 Currently, NTX is currently required in field 10 and JKDM Accounting Software Unit is of the opinion all registered person should manually key in item 15 even though TAP has not been upgraded yet. Further clarification will be made. 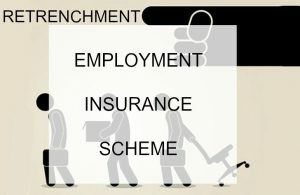 What is the Employment Insurance Scheme (EIS)? The EIS is a social security network aimed at helping workers who lost their jobs with financial assistance and programs to seek new employment. The EIS consists of two main components; Employment Insurance and Active Labour Market Policies.The Employment Insurance will give affected workers financial assistance to support themselves and their families while looking for new jobs. The workers will also be given additional financial assistance if they undergo accredited training programs to enhance their marketability.The Active Labour Market Policies consist of Redemption Service Program to support affected employees by helping them to get new and appropriate job securely. This includes the help of career counselling, job search and matching as well as training. Effective date of EIS and when do one benefit from the EIS? The EIS has been gazetted on 29th December 2017 and is thus effective from 1 January 2018. Therefore the first contribution will be made by 15 February 2018 for the January Payroll. As the scheme only benefits an employee that have contributed at least 12 months of EIS, the earliest an employee can only claim these benefits are those that are retrenched from 2019 onwards. Who is covered in the scheme? Employee is a person employed by an employer under a service contract or apprenticeship. The service contract or apprentice is either written or oral, express or implied. All employees aged 18 years to 60 years old must be nominated except for employees aged 57 years and above and no contribution has been paid before reaching 57 years. The termination of the insured person’s service contract is due to misconduct. The key eligibility requirements that must be met by beneficiaries are they must be able to work, be willing to work and actively seek employment. What is the rate of contribution for EIS? The contribution rate for EIS is from 0.2% of Employee’s monthly Salary and 0.2% from the Employer’s share. The Contribution rate is subjected to the second schedule of Section 18 of the Employment Insurance System Act 2017. When and how do an Employer contribute? Similar to EPF and SOCSO, the EIS will need to be submitted and contributed by the 15th following the Payroll Month. An example will be submitting by 15th March 2018 if the submission/contribution is intended for the Payroll Month of February 2018. The EIS is contributed to PERKESO, and the submission and payment can be done online via their new online portal. If you are an IPerkeso user, you will need to fill up and submit SIP 1A and SIP 2A to PERKESO. This is to update your company and employees details respectively to PERKESO. You may continue to use the IPerkeso System till you are notified of the change of system. Otherwise, you will need to fill up “SIP 1”, “SIP 2”, “Portal Assist Enrollment Application Form” and submit the completed form to the PERKESO office near you or emailed to idportal@perkeso.gov.my. 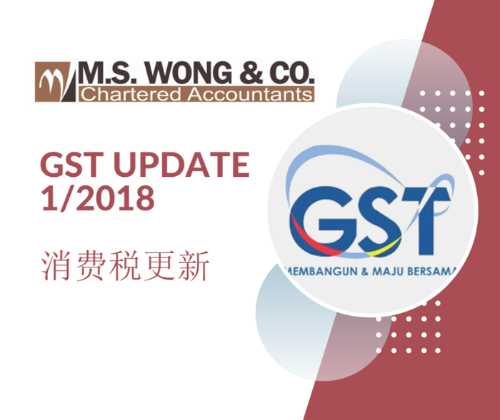 Effective January 2018 wage/salary (February 2018 EPF contribution), the statutory contribution rate for employees’ share will revert to the original 11% for employees below age 60, and 5.5% for those aged 60 and above. Please refer to KWSP website for more details.Employees who wish to contribute more than the statutory rate of 11% or 5.5% may do so by completing Form KWSP 17A (AHL) or Form KWSP 17AA (AHL).